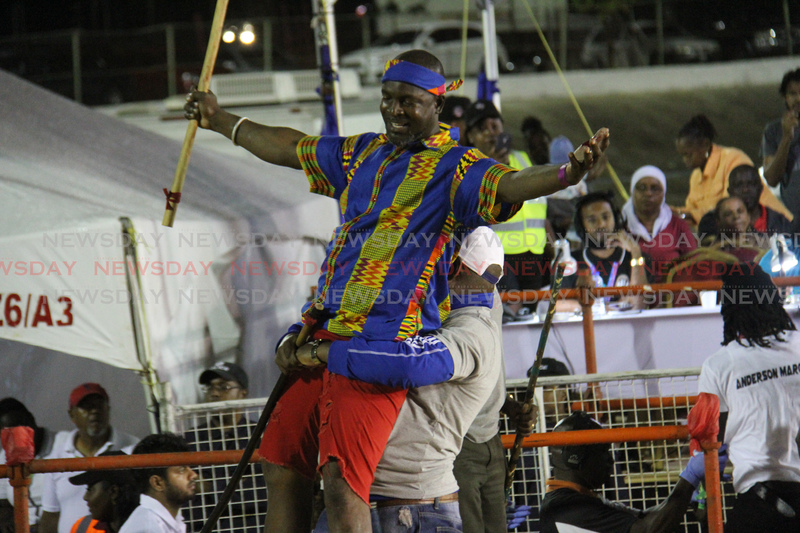 THE Princes Town Gayelle took home the team title at the National Stick Fighting finals on Wednesday night at the Arima Velodrome. Four Gayelles competed, St Mary's, Princes Town, Newtown Boys and Valiant Brothers. King of the Rock went to Roger Sambury. Sambury fought Anderson Marcano and dethroned 2018 champion Ralph Moses en route to the crown. The preliminaries were held in Moruga and the semi-finals in Mayaro. This was the first time the finals were held in Arima. The rain did not deter spectators as the show, originally carded to start at 7 pm, got rolling shortly after 9 pm. The rains came down, umbrellas went up, and the stick fighting went on despite the slippery platform which had to be swept several times to get rid of the water. 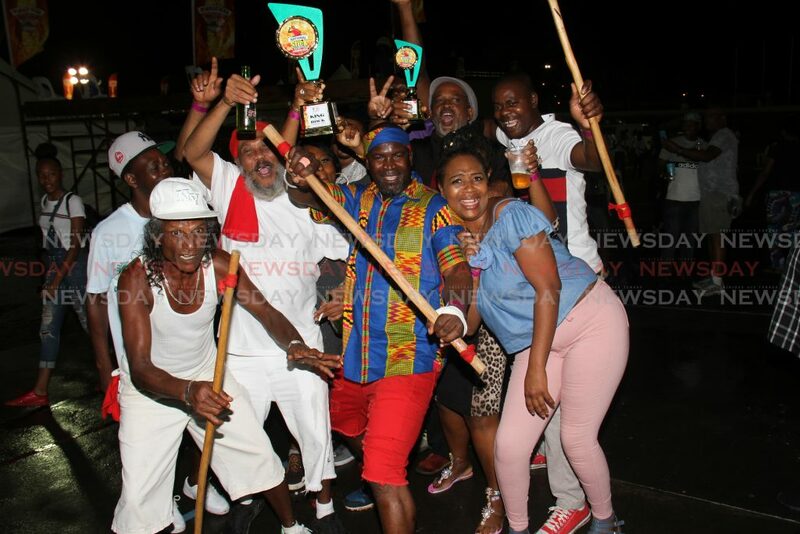 Asked why the Stick Fight Committee did not provide a tent for the fighters and spectators, a National Carnival Committee official said a stick fight gayelle never had a tent, it was always open air. "It is unfortunate that the rain is falling tonight, but you will never see a gayelle in a tent." The fighters had to contend with a wet platform that had no grip and were often left to contend with the elements. Spectators paid no mind to the frequent showers, and in fact embraced the cold rain as a representative from God. The announcer for the event gave his advice: "If you can't brakes, don't play. If you want to watch, take wet." The drums resonated with an almost hypnotic rhythm, the fighters sleek and lithe, sticks raised, sizing up their opponents. and it was "bois dur" (hard wood). Some may see it as just a plain old stick, but was wielded with such expertise it was more of a weapon. While there was no geysers of spurting blood, some of the fighters sustained injuries to their fingers and arms, some to their chest and back. There were some who felt that the judges were biased towards certain fighters, but the show went on without a hitch. The best bois man in the land, the King of the Rock, Sambury, said he has been involved in stick fighting for the past three years, but this was the first time he entered the King of the Rock. "I feel very grateful and I thank God, and after God I thank the ancestors for giving me the victory. I got a lot of support from my work colleagues at Galeota. I am a rigger. I didn't want to come today because I had plenty injuries and they gave me the courage to come out," he said as he held up a heavily bandaged hand. Sambury said stick fighting was in his blood and will compete again next year. His win came as no surprise. I want to have a reunion with everybody and with Ralph Moses. He was the King of the Rock last year. People say stick fighting is a dying art, but I don't think so. It will never die." Reply to "Sambury is King of the Rock"